Here is a recipe for a quick snack, which is ready in a jiffy when you have unexpected visitors. Red chilli powder ... 1/4 tsp. 2. Cut rectangles of bread slices. 3. 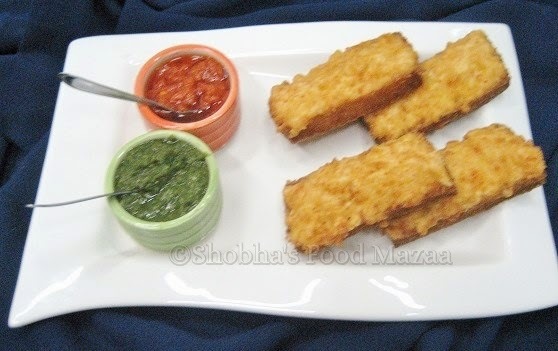 Spread batter on one side of the bread rectangle and fry it. Note: The side of bread with batter should face down first while frying. This quantity makes 8 pieces. this seems to be such a yummy snack! Will definitely try this! 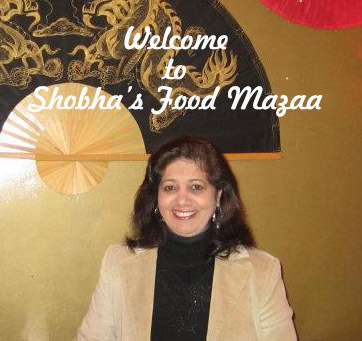 Happy new year, Shobha! Oh my, this looks so yum..! Straight out of pizza huts menu..! Looks inviting and is sure a kid's favorite. Thx for linking. True.. kids would love these. Appealing snack! kids would be pleased to munch these. Kids surely love cheese... very tempting. Can this be made without using egg? If yes then, what changes are to be made to prepare batter? Replace the egg with a mixture of corn starch and water. Wow.. Such a delicious and tempting snacks.. Not only kids, even elders love this ! Very true.. thanks for liking.